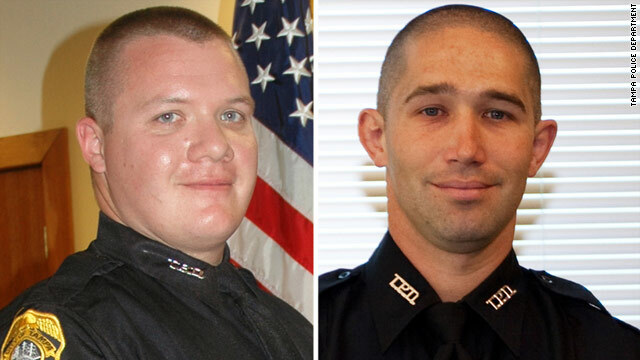 Officers David Curtis, left, and Jeffrey Kocab were both 31, according to the Tampa Police Department. (CNN) -- Authorities are "tightening the loop" on a suspect in the Tuesday shooting deaths of two Tampa, Florida, police officers, Police Chief Jane Castor said Wednesday. "We are receiving active leads, and we are following up on those leads," she said. A $95,000 reward is offered for information leading to the arrest of Dontae Morris, Castor told reporters. Morris, 24, is accused of shooting Officers Jeffrey Kocab and David Curtis during an early-morning traffic stop near downtown Tampa. Both later died at a hospital. Authorities have contacted Morris' family, friends and associates, Castor said. "We are basically tightening the loop on him. ... In essence, we are trying to plug any possible escape routes that he may have." Police are attempting to cover "possible avenues" in Tampa and in other Florida cities, she said. She said Tampa police, as well as the slain officers' families, have been moved by an outpouring of support from the community. Kocab's wife is due to give birth next week, authorities said Tuesday. Curtis leaves behind a wife and four sons, ages 9, 6, 5 and 8 months. Both officers were 31. Castor defended the decision by police to release Cortnee Brantly, the woman believed to have been driving the car at the time of the shooting. Brantly, 22, was questioned Tuesday for seven hours. "We have received information from her, but I would not describe her as cooperative," Castor said. Although authorities had enough information to arrest Brantly, she said, their focus is on locating and arresting Morris, but "there is still a very, very distinct possibility she will be charged down the road." "I understand, from the public, that level of frustration," the chief said. "The community needs to trust in the ability of the TPD." She said Tampa police are professionals and their goal is to take Morris into custody safely, but "it's in the best interest of Dontae Morris to give himself up." Asked if police have "eyes" on Brantly, Castor said, "We have eyes on a lot of people out in the community." She said she had no doubt Morris was receiving help. "We've got a jail cell right next to Mr. Morris, she said. "If somebody's harboring him, they're going to face charges." Tampa Mayor Pam Iorio said the officers are determined to take Morris into custody, but "they are grieving. I see it in their eyes." Curtis pulled the vehicle over about 2:15 a.m. ET Tuesday, and Brantly gave him identification and vehicle registration that did not match the vehicle, Castor said. Running a criminal history check, Curtis found that Morris had an outstanding warrant for a worthless check out of Jacksonville. He called for backup, and Kocab responded. Castor said Tuesday that as the two officers attempted to arrest the suspect, he pulled out a gun and shot both of them. A gun was not found at the shooting scene, the chief said Wednesday, and authorities believe Morris may have it with him. Castor said she was "surprised" Morris has been able to elude capture "for this amount of time." "I ask for the community's assistance in this," she said. "We need to work together to take him into custody." The officers "followed every safety protocol," and did as they were trained, Castor said. Morris has a 14-page rap sheet from the Florida Department of Law Enforcement, according to CNN affiliate WFTS. He was released from prison in April after serving two years for a drug conviction, the station reported. Castor said the worthless check warrant was issued while Morris was in prison. Police will investigate how he was released while the warrant was outstanding, she said.